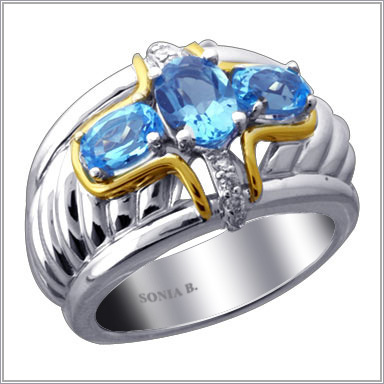 Sterling Silver / 14K Gold Blue Topaz & Diamond Cross RingPrice includes 30% discount. Brighten your day with opulent glow of a heavenly blue hue. This ring is crafted in polished and textured sterling silver and 14K yellow gold. It features one oval cut 7 x 5mm at the center and two oval cut 6 x 4mm blue topaz stones in prong settings at the side. This cross style formation also features 10 full round cut diamonds in a stunning vertical line. The total blue topaz weight is 2.18ct and the total diamond weight is 0.09ct (both approximate). The diamond color is H-I with a clarity of SI-3. The setting size is 9/16" x 13/16" with a height of 1/4". It also has an undergallery for added beauty and comfort.